I posted a photo of some thinly sliced Hasselback potatoes on instagram a while back, mentioning that we would roast them, add kale, beans, onion and cherry tomatoes, slather with pesto and call it dinner. The response was unusually loud for such a humble dinner that we decided to recreate and share this simple recipe here. 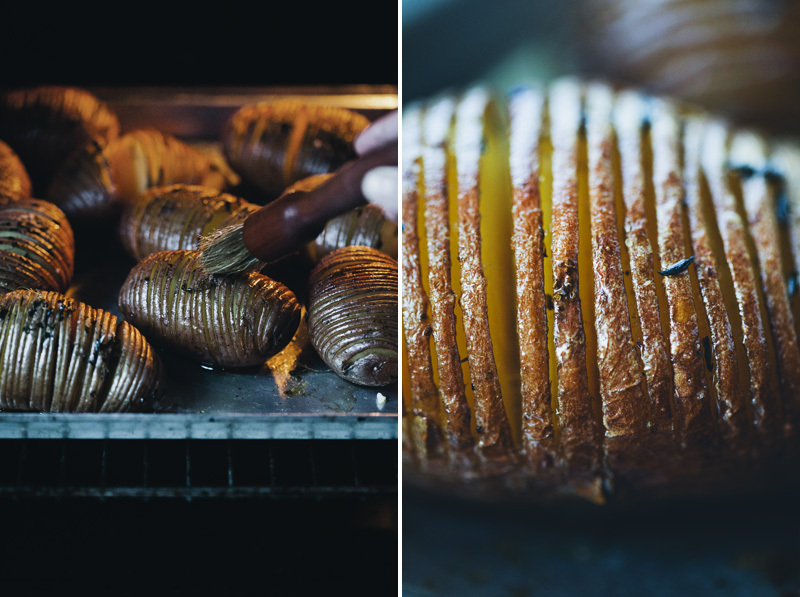 I’m sure you have seen this potato technique before – slicing them thinly but not all the way through, drizzling with fat and baking them until the edges are crispy and the middle is creamy and soft. Hasselback potatoes were apparently invented at a restaurant here in Stockholm in the 1950’s, as a method to shorten the baking time. It was an extremely popular dish when I was around Elsa’s age (almost 30 years ago!). My mom made Hasselback potatoes almost as often as she did her famous baked sausage stuffed with pineapple and cheese. And it has seen a revival in the past years now being popular all over the world. We like to stuff the herbs into the slices to give it more flavor and also helping the fat to find its way inside the potato. The original version uses butter and breadcrumbs but we’re simply using oil. I’m sure some almond flour could be tossed on top towards the end of the baking, if you like it with a little crust. A good trick is to place the potato in a large wooden spoon when you cut it to prevent from cutting it all the way through. Or placing it between two chopsticks. 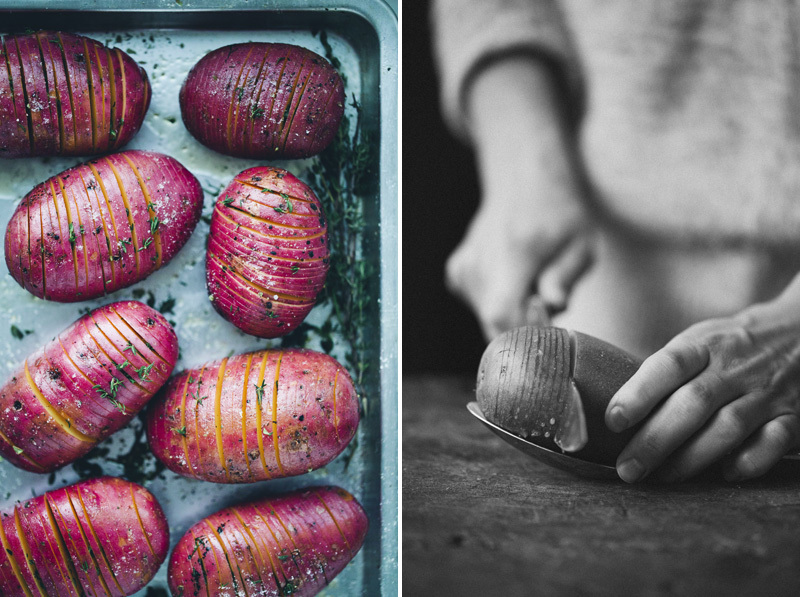 On the photo above, Luise uses a metal spoon which both makes it more difficult to slice because the potato isn’t flat and it can be bad for the knife. So not the best example. What can I tell you, she’s Danish and she doesn’t like to follow my instructions, so I’ll publicly shame her here instead. We have also updated our Green Kitchen app with 6 Christmas recipes. 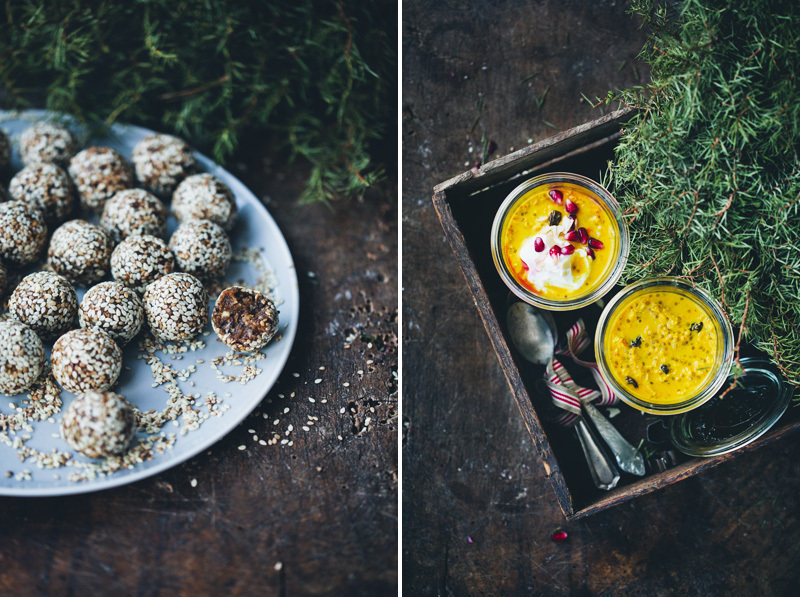 Apart from this Hasselback Potato recipe and some favorites from last year, you’ll also find these simple Sesame & Gingerbread Truffles and this delicious Saffron Overnight Oats recipe. Enjoy! The baking time can vary depending on the potato size and variety. Smaller potatoes will need a little less time. 2. Wash and scrub the potatoes. 3. Slice each potato thinly. Let each slice cut about two-thirds into the potato, leaving the bottom intact. This is easiest done by placing the potatoes inside a large spoon, the edges of the spoon will then stop the knife from cutting too deep. 4. 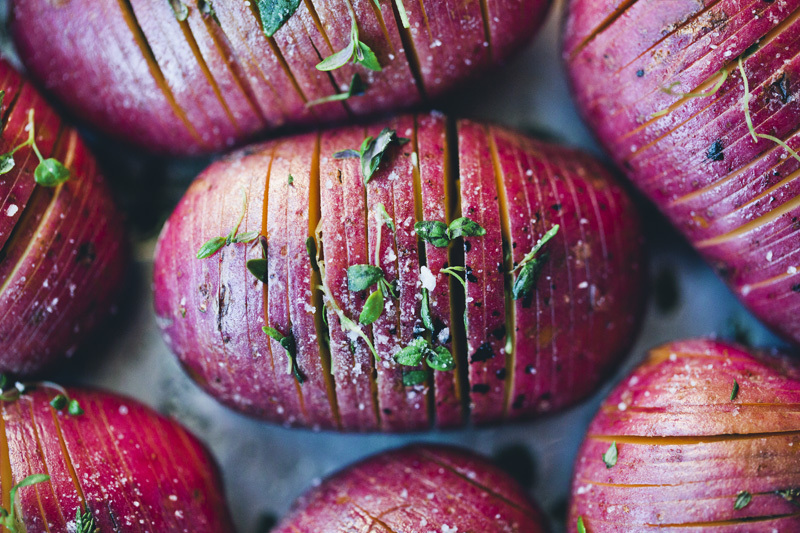 Tuck some thyme leaves sporadically between the slices of each potato and place them on a baking tray. 5. Use a brush to drizzle the potatoes with about half of the oil and then sprinkle with salt and pepper. 6. Bake for 30 minutes and then brush the potatoes with the remaining olive oil. The potatoes should have started to fan out slightly which will make it easier to get some of the oil down in-between the slices as well. If the slices are still stuck together, you can let them roast a while longer before adding the last oil. 7. Bake for 30 minutes more. Meanwhile, cut the onion in thin slices and place it in a bowl along with the kale, beans and tomatoes. Drizzle with olive oil, salt and pepper and toss to combine. 8. When the potatoes have been in the oven for about 1 hour in total, arrange the onion, kale, beans and tomatoes on the tray, around the potatoes and bake for 15 minutes more, or until the potato edges are crispy and the centre feels soft when pierced with a toothpick. 9. Drizzle pesto over the potatoes and kale and serve immediately, while still hot. Finally, can we just say a massive Merry Christmas / Happy Hanukkah or whatever you are celebrating! This has been an intense year for us with books, babies and everything. We haven’t been posting recipes as often as we intended but we want to thank you for your constant support and cheering comments. We have lots more planned in the near future so stay tuned. BIG LOVE!